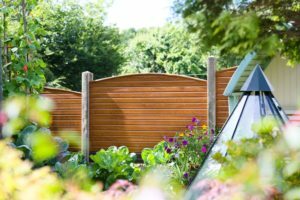 When the time came for Derbyshire couple Sue and Tony to transform their garden, they were determined to replace their rotten fence with something that not only looked beautiful, but wouldn’t be time consuming to maintain. 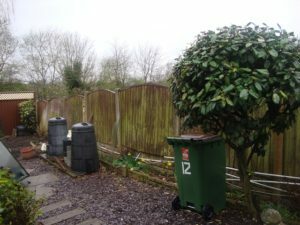 “My partner Sue and I have been steadily undertaking a total makeover of our property over the last few years and this year it was time to give the back garden a much needed shake-up. 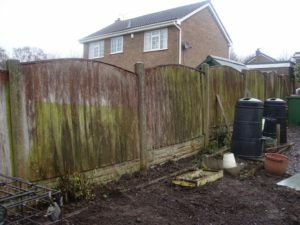 “Sue took to the internet at the beginning of the year in search of fencing inspiration to replace the sheets of dilapidated splinters that remained of the dividing structure between us and our next door neighbours! 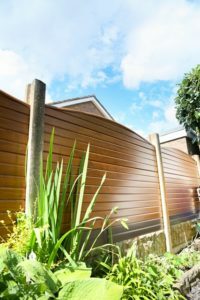 “Our main priority was to find something that didn’t need to be maintained – which immediately ruled out wooden fence panels – and something that would slot straight into the existing concrete posts. “Plastic was an obvious option, but we’d heard worrying reviews that there was inherent problems with that material too. Brittleness from weathering, sagging from many hours in the sunshine (not that we get that many hours in Britain! ), and colour fade. “Sue searched Google for plastic fencing and spotted Liniar straight away. We were impressed by the look and sound of the products, and the fact that they were manufactured in Derbyshire, local to us, was an added bonus. “We looked at some other options but in the end decided to contact Liniar in the hope that we could either see the quality of the product, or at least learn more about what to look for. “Sue was put through to a lovely chap called Les (Paternoster, Technical Sales Manager for Liniar’s Outdoor Range), and he kindly arranged for us to visit the factory, which was only five miles from where we live. 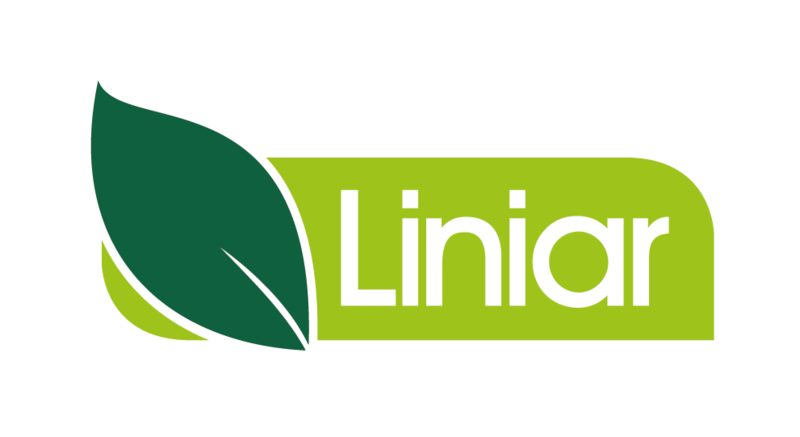 “We were very impressed with this generous gesture, as we’re prospective end users and very likely leading to a one-off sale, rather than a company looking to do repeat business with Liniar. “Despite this, Les arranged for us to pay him a visit and he showed us the fencing range, which included the foil covered options which had been recently introduced at that time. It seemed like we’d found what we’d been looking for! “We loved the look of the Golden Oak and were informed that it would take four sections to form each full panel to the height we required. Each of the sections comprises of a pattern representing four wooden laths so that when fitted together it’s impossible to tell that it isn’t one complete panel. “Les gave us a couple of samples and the address of a local supplier, Gemstone in Little Eaton. We paid them a visit and met Richard, who went through everything we needed to place an order. 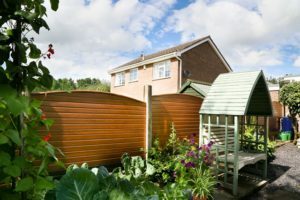 We chose curved tops, which we preferred to a straight top fence. 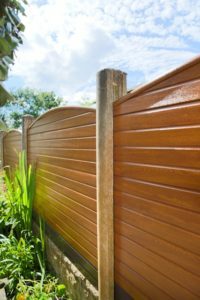 “At this point I suppose I’d better mention something about the price, as we were quite aware that we would be paying approximately two or three times the amount of an equivalent wooden fence. 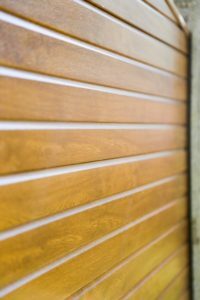 “However, we know we won’t have any of the maintenance costs that timber requires and we’re confident that Liniar’s quality product will keep its appearance, colour and shape for many years longer than cheaper versions. “So, in the long run, the price becomes more comparable to other options and achieves everything that we were looking for in the first place to do the job once and for all. “It was pouring with rain when the Gemstone driver delivered the 28 panels we’d ordered, but the weather was much nicer the next day when we started to slot the sections into place, finishing each panel off with a curved top, each one a nice, tight fit. 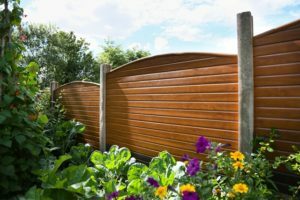 “The new fencing finally looked finished and looks even better now that the flowers are out and the garden is bright and colourful. 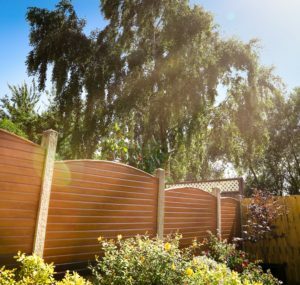 To contact Gemstone call 01332 833640 or find out more about Liniar’s fencing range here.